Fans of Trader Joe’s know that this time of year is when the stores roll out their holiday food items. Rather than simple packaging changes (from “regular” to “holiday”), TJ’s always has a big selection of chocolates, biscotti, nuts and other gifty, snackable products on their shelves. 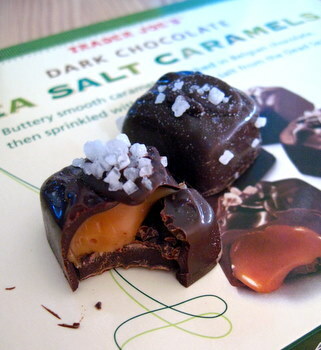 The very first items that caught my eye this season were the Dark Chocolate Sea Salt Caramels. You can’t get a much better combination than salt, caramel and dark chocolate, and I couldn’t resist knowing if the product inside the box looked as good as the ones in the picture. The caramels more than lived up to my expectations. They looked just like they did on the box: a thick layer of crisp, dark chocolate surrounding a soft, melting caramel center, all topped off with a huge pinch of large-crystal sea salt. The chocolate was shiny and had a perfect snap when I bit into it, which is generally a good indicator of freshness and quality. I really enjoyed the fact that the caramel was not the thick and chewy variety, as it might have overwhelmed the other flavors. 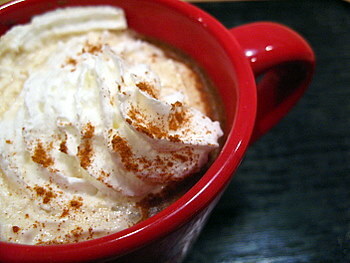 As it was, there was a generous amount of caramel to balance the flavor of the chocolate. 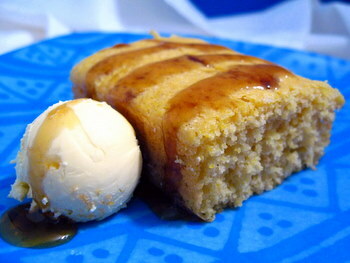 There was also enough salt on top to really set off all the mouthwateringly delicious notes of the sugar and butter in the caramel after every bite. The chocolates are packed in a of of 12 and, while their packaging might not hold up to the presentation you’ll get when you buy ultra-expensive gourmet chocolates, the flavor definitely will. Just get an extra-large bow for your box and you can easily give these as a gift. Or just keep them for yourself. It doesn’t take that long to get through the whole box…. Good to hear! I picked up a box in the store the other day, turned it in my hands, and said no, I don’t need a box of chocolate right now. Guess I was wrong! wow, that sounds good. i am such a sucker for the salty/sweet combo. i can’t eat popcorn without a chocolate side dish. I am so jealous of all who live near a TJ’s! Yeah, I grabbed those up the minute I saw them! I miss Trade Joes 🙁 those sea salt caramels look delicious! I picked these up based on this review and I just tried one. I wish the chocolate was a hair thinner but otherwise, YUM. Not quite in the league of Fran’s ones (franschocolates.com) but still fantastic. This combination is fast becoming my favorite for candy… though I’m thinking of trying just a hint of cayenne with it, too. i am crazy about these dark choc.covered caramels with sea salt on top. berst candy i’ve ever put in my mouth. i would like to order a dozen boxes. how can i do that. please let me know. thank you! I know it says do not refrigerate, but I find the consistency not as “grainy” after I refrigerate it. Still on the hunt for more Chocolate Sea Salt Caramels since I prefer the centers to be firmer in texture.